I present to you the single finest sausage roll ever to grace the face of the earth. The Ginger Pig sausage roll. 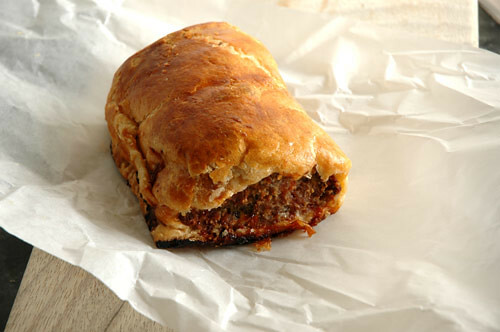 I kid you not, it really is the most magnificent collision of sausage meat and pastry ever to grace the mouths of men. You might not really get excited by a sausage roll, you might not think they are one of the finest and most noble of pastries and you'd probably be perfectly justified, but you'd be wrong. I don't know, I am easily excited by the thought of a sausage roll, so go easy on me. But I am concerned about the meat to pastry ratio of this one. I think I might be in favour of long and thin over short and fat. I haven't had a good sausage roll since living in London in 1985. I know what you mean there Sam, but this bad boy changed my mind. Dave, my god man, you stopped living in '85!! I'm not sure. I favour the Mrs King's pies ones. The meat to pastry ratio is out, and it's just too big to eat without discomfort. I'm with Monkey Gland on this. I thought it looked like it needed more pastry. Then I tried it and realised just how good the meat was. I still haven't bought one of my own though. I just steal bites off other people's! Alright! It's now on my to-try list!